Tattoo equipment suppliers Body Shock have become official stockists of Spirit products. Spirit's exciting new Green range. We love the fact that all of our customers can experience the art of tattoo stencils. Body Shock have long been known for their commitment to professional tattoo artists around the world, and they are proud to announce that they are now the official EU distributors for Spirit products. 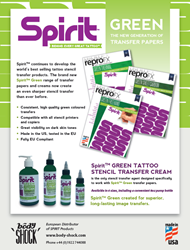 Body Shock are especially pleased to offer their customers Spirit’s all-new Green range of transfer papers and creams, alongside the Spirit Brother A4 mobile thermal printer. Spirit, who have played a part in tattoo culture since 1946, are widely considered to be the best in the business, thanks to the high quality of their tattoo stencil transfer products. Their products are designed to give tattoo artists the opportunity to design and print images that are created on a computer or drawn by hand, which can then be transferred to the skin, allowing artists to artfully trace the design with their tattoo machines. The Green range of products, which are made in America and tested in Europe, give artists the best possible clarity to an image, and offer improved visibility on those with dark skin tones. There are currently three types of transfer papers available on the market, giving artists the choice to create designs in a way that they are comfortable: freehand, carbon and thermal. Each of these papers is layered with specially blended waxes and dyes, which ensure that the stencils maintain a clear, crisp look that tattoo artists can rely on. 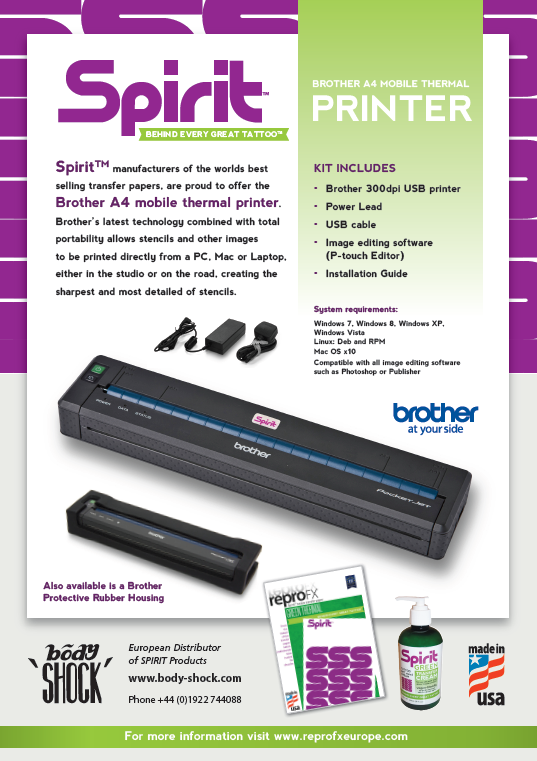 Alongside the Green range, Body Shock will also be stocking Spirit’s A4 mobile thermal printer, manufactured by Brother. The mobile thermal printer lets users print directly from their PC, Mac or laptop, no matter where they are. The thermal printer is specifically designed to print the sharpest images, meaning tattoo artists can be confident that they are working with the best possible, and most highly detailed, images available to them. The Spirit collection is available now from Body Shock. Body Shock has been offering the finest quality tattoo equipment and body piercing jewellery to artists for over 25 years. With offices and factories in both the UK and the USA, they are also dedicated to manufacturing high-quality accessories, investing in state-of-the-art technology and attending exhibitions and conferences across the world, in order to stay not just on top of, but ahead of, the latest trends, developments and styles. Body Shock are proud stockists and distributors of such brands as VIP – Series products, Eternal Ink, Kuro Sumi Ink, Millennium Ink, Skin Candy Ink, Starbrite Ink, Bloodline Ink, Spirit Transfer Paper, Tattoo Goo, Hulk Super Bond , Dynarex Medical Supplies, Emu Oil, and Tattoo Therapy Aftercare. Few other tattoo art suppliers can match the quality and care of Body Shock’s exciting products and friendly service. For more information about Body Shock and the Spirit range of products, visit their website at http://www.body-shock.com or call 01922 744 088.